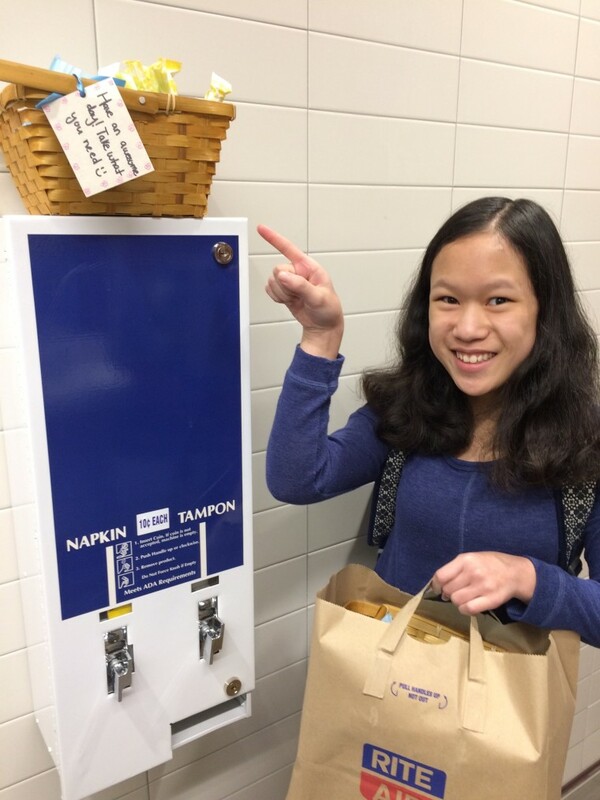 Earlier this year, 14-year-old Cordelia Longo went from one building to another at her middle school, trying to find a restroom with a working sanitary napkin and tampon dispenser that wouldn’t take all her change. But after spending her last dime at an empty machine, Longo felt embarrassed, discouraged and angry, she told NBC News. Before realizing she had one sanitary napkin remaining in her backpack, she didn’t know what to do. After the experience, Longo felt determined to channel her frustration into action. While the school provides feminine hygiene products at the nurse’s office and locker rooms, Longo said that their availability is not well-known. Inspired to address the situation, Longo drafted a petition informing students of the lack of feminine hygiene products in the girls’ restroom and obtained 100 signatures from her classmates. “I absolutely think pads and tampons should be treated like any other product because they are just a product, like toilet paper,” Longo said, noting her frustration about the “pink tax,” which she said is discrimination against women. While the petition and letter were being reviewed by the administration, Longo decided to use some of her allowance money to create baskets and stock them with pads and tampons and place them in the girls’ restrooms at school. Longo says her inspiration for launching the petition also came as a result of the skills she gained in her social justice class, where she learned about oppression, race and gender identity, among other topics. Longo credits a big part of her interest in social justice issues and politics after closely watching the election. “Hillary Clinton inspired me because she kept being strong and she didn’t take any of the insults people threw at her and didn’t let it affect her,” she said. A Mien-American adoptee, Longo was born in Sacramento, California, and adopted at age 1 and raised in San Francisco before moving to Seattle. Mother Jennifer Longo said that since moving to Seattle, the family has helped connect their daughter with the Mien community, noting that her daughter is very proud of her Mien heritage. “I actually didn’t know a lot about my culture until recently because my parents got me interested in the Mien culture,” said Cordelia Longo. The 14-year-old says she is deeply passionate about social justice issues, linguistics, journalism, and writing. She credits the character of Rory from her favorite TV series, “Gilmore Girls,” as one of the reasons why she wants to be a journalist someday. “Rory Gilmore was a role model for me because the show is such a feminist show, and I really just like to watch a show about women and their struggles,” she said. Longo is glad she created this petition and is grateful for all the support she’s received. “I feel like if we all get together, all of the people who are in favor of social justice and equal access to education, I feel hopeful. I feel satisfied that I created this petition and wrote this letter and made a difference in our school,” she said. Jennifer Longo is proud of her daughter for standing up for what is right, noting that even as early as elementary school, her daughter has always spoken out about injustices. She added that middle school is often a time when girls may get their first period, which can be an equally scary and confusing moment. Longo commended the administration for their quick response in addressing the issue. “I think it’s incredible — it took three weeks from start to finish and they were on it,” she said. Due to Cordelia’s petition and efforts, the district has also agreed to disable the machines at the local high school as well, according to her mother.